Global Lyme Alliance’s commitment to identify and fund innovative and promising Lyme disease research is unrivaled. 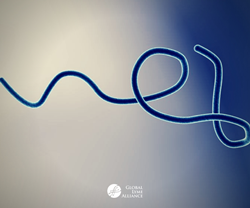 A vital component to GLA’s leadership role in Lyme disease research is its success with early-stage funding. Discovering and supporting researchers who are new to Lyme, but bring years of relevant disease work or are at the beginning of their careers, helps distinguish GLA’s approach to finding the evidence-based answers that will ultimately help patients. In 2016, GLA funds Dr. Lewis' well-regarded study "Discovery of new antibiotics and combinations"
In 2018, Dr. Lewis publishes important paper on novel therapies in Antimicrobial Agents and Chemotherapy, "Identifying Vancomycin as an Effective Antibiotic for Killing Borrelia burgdorferi", based on GLA funding. Dr. Lewis’ team found that Vancomycin was effective against in vitro cultures of growing B. burgdorferi. However, this class of drugs is not expected to work on stationary persister cells, in which growth is very slow, and cell wall synthesis is expected to be minimal. Unexpectedly, when tested on stationary B. burgdorferi, they found that cell wall synthesis still occurred, and could be blocked by Vancomycin. To extend their studies to an in vivo model, the group treated B. burgdorferi-infected, immunodeficient mice for five days. They found that Vancomycin and Ceftriaxone each completely blocked bacterial growth, compared with partial eradication by Doxycycline. These studies suggest that more effective antimicrobial drugs, used early in infection, may prevent or reduce the occurrence of persisting infection. In 2019, GLA helps facilitate clinical trials leveraging Dr. Lewis' findings with respected Lyme-treating physicians. Clinical trials performed under the guidance of GLA's rigorous peer reviewed process will ensure valid results, to most effectively impact patients. Lyme disease is extremely complex, and the challenge to understand it and ascertain how to most successfully treat patients impacted by it is a herculean task. Through an aggressive and innovative research strategy, backed by a world renowned Scientific Advisory Board and top-notch in-house science team, GLA is finding the answers.